The state of Himachal Pradesh offers some of the spectacular mountain sceneries in India. The state is bestowed with pleasant climate, rich natural heritage, warm and peace loving people. All the above facts are well documented and well known to the world. At the same time, Himachal Pradesh boasts of a very rich architectural heritage which is relatively unknown. Himachal is home to various architectural typologies and construction techniques. These are innovative and appropriate response to the extreme conditions, local materials and surrounding context. The state forms an interesting montage of superstitions, religious beliefs and customs. An exploration of these remote areas reveals to us one of the oldest architectural construction typologies. One similar offbeat adventurous destination is the Tower Fortress of Chaini Kothi. Situated around 100 kms from Manali, in the district of Kullu lies the small village of Chaini, in south-eastern Himachal Pradesh. The village is situated high up at an altitude of around 2300 meters. 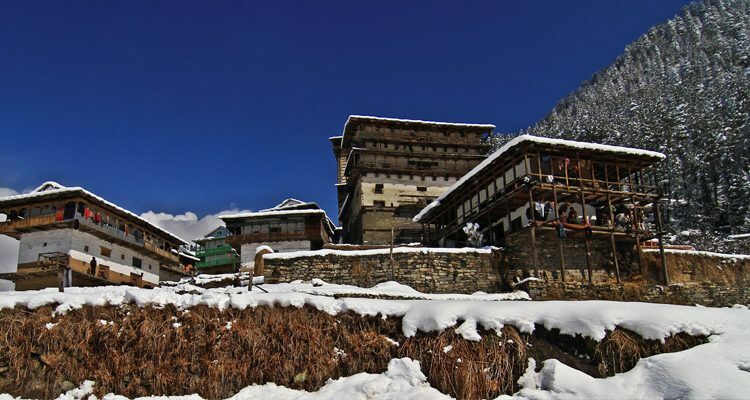 Chaini village is surrounded by the dense deodar forest overlooking the picturesque Tirthan Valley. It’s very hard to believe that there is still no vehicular road to reach the village. This is how remote the village is, away from hustle and bustle of the world, situated in the laps of mother nature. There are mainly two routes to reach the Chaini village. Route 1: From base village Bihar to village Chaini which is a gradual one hour trek. Route 2: From Shringi Rishi Temple at Baggi to village Chaini which is one hour moderately steep trek. Both the routes pass through apple orchards, deodar forest and farm lands. Locals mainly take the path from Shringi Rishi Temple. It’s mandatory for locals to first take blessings of the Shringi Rishi before heading towards Mata Jogini on top. Beginning from the temple, a well-defined trail leads you to the village, including a gradual climb through breath-taking vistas of the Tirthan Valley, peppered with apple orchards and apricot blossoms. Try not to rush on the route to Chaini. As one keeps moving up hill, the place turns out to be more and more photogenic. There are lots of good spots for social media uploads. After a little climb, the well defined pathway suddenly disappears. What is left is a rough mud path which is build by the villagers. There are no signs or boards showing the direction to the village. One just has to keep following the mud path and enroute have to take help of locals whom you meet on the way. As you start nearing the village, one encounters coming across beautiful old houses built in traditional pahadi architecture. The architecture of Himachal Pradesh is unique in character and is very different from the rest of India. This exclusive style is reflected not only in the palaces, temples but also in the local residences of the region. Chaini village is known for its stone and master masons which is easily visible on the buildings of the village. In a walk around the village, one comes across many simple yet beautiful houses. In early days, the village was inhabited by the Thakurs. The houses surrounding Chaini Kothi appears to be old but seemed very safe and sound. Ancient villages had defense structures built to foresee any enemy attacks. These defense towers are known as ‘kots’ or ‘kothis’. The most famous of them is the Castle Temple of Jogini known as Chaini Kothi or Chaini Fort. According to the locals, Chaini Kothi was built in the 17th Century by King Dhadhu. Therefore, sometimes Chaini Kothi is also referred to as Dhadhiya Kothi. In 17th and 18th century, Chaini Kothi served as a defense structure guarding the Chaini village and the surrounding Tirthan valley. Later it was converted into a temple dedicated to Jogini Mata. Chaini Kothi is the tallest free standing structure in the entire Himalayan region which was built in a architectural style. Chaini Kothi is around 30 meters tall in current condition. It has lost its two upper storey’s during the Kangra Earthquake of 1905. Architecture of Chaini Kothi is an indigenous method of pahadiarchitecture. Chaini proudly host marvels of the indigenous kath – kunni style architecture which had been built by master masons centuries ago. The word Kath is a dialectal variation of the Sanskrit word Kashtth, which means wood and Kunni is a variation of the Sanskrit word Kona which is an angle or a corner, i.e. wooden corners at right angles. Chaini Kothi’s most prominent feature is its ladder, which clings steeply onto the structure. The ladder is made of one huge log of the deodar tree. The ladder is very narrow in width and appears to be hanging at a great height. One needs to be careful about personal safety while climbing it. Chaini Kothi is indeed an architectural masterpiece. It’s an epitome of the indigenous Kath- Kunni earthquake resistant construction technique. This traditional construction style has been transferred through hereditary knowledge system of Master masons. This ancient system is still in practice. Due to geographical terrain and constraints, the architecture one sees in Chini is basically what we call raw architecture, a simple yet beautiful play of locally available materials like stone and wood in this case. The tower of Chaini is an icon of the local kath-kunni architecture style and over time has become the epicenter of the social and cultural life of the village. Unfortunately, today this heritage is in a delicate state. With the passing of time and unsustainable development, the village of Chaini is in need of urgent attention and restoration of its community and social fabric along with its environmental and architectural heritage. The Bhandar is a community storage for wealth of the Temple Goddess like utensils, silverware and musical instruments of the village; meant for only special festivities. All these possessions are maintained by the care-taker who is the only person permitted in the Bhandar. The Bhandar faces the Jogini Mata temple and comes alive during the village festivals. Another huge building, constructed in a similar style to Chaini Kothi, has now been converted to a Krishna Temple also known as Murlidhar Temple. KrishnaTemple is a five storey building believed to date from the same time as Chaini Kothi. In earlier times, this was the imposing residence of the ruling Thakurs. It takes us in an enchanting journey to the past. This striking and grand structure is one among many architectural masterpieces of Chaini. The specialty is that the community participates in this building process under guidance of the chief master mason. One can learn more about the Kath – Kunni style of construction, craftsmanship and famous folklore about these temples and their gods who guide them in building these master pieces. Built with local stone and deodar wood, it best exemplifies the use of local construction material to reach staggering heights. It has the potential to captivate, motivate and inspire architects and non-architects alike for generations to come. Chaini Village is the best example of architectural heritage of Himachal Pradesh. These architectural icons form an intrinsic part of the tangible heritage and ways of life in these remote highlands. This ancient village of Chaini and the majestic tower of Chaini Kothi acts as a window to the local culture, customs and religious beliefs. With unsustainable development making fast inroads into these Himalayan regions, it poses a grave threat to this architectural and natural heritage. These indigenous technologies and architectural heritage must be taken up for conservation on a war footing and should be our relentless endeavor to achieve this goal. As they say, “Put some miles in your soul. See a little bit more out there and you will never be disappointed”. This is exactly what one feels after visiting this mystic village of Chaini and its Fortress-Chaini Kothi. It’s an uphill task in today’s modernization to catch such moments of tranquility amidst the disharmony of digital madness that surrounds us. LOCATION: Village Chaini Kothi is located in Banjar Tehsil, dist. Kullu, Himachal Pradesh. Kullu – 60 Kms, Manali – 100 Kms, Mandi – 80 Kms.